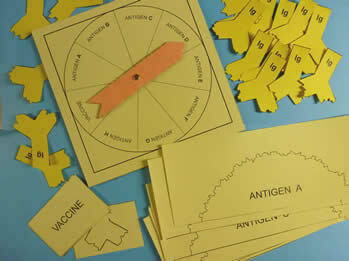 A hands-on way to learn how antibodies bind to antigens (through “lock and key” principle, based on matching shapes). This game is for 2 to 4 players. More players can be accommodated by making extra game parts. Players are challenged to find antibodies that match the shape patterns on the antigen cards. The first team to get five matches wins. Vaccine cards will give that player a head start on finding the correct antibody. Several paragraphs of (read-aloud) background information are given in the instructions, so that the players will understand the science they are supposed to learn. Best use of the game is as part of a unit on the immune system, but it can also be used independently, with just a bit of background info. 30-60 minutes assembly time per game (depending on how fast and how accurately you can cut and whether or not you have helpers), and 15-20 minutes per game (play multiple times) NOTE: All that time cutting out the antibodies will be well worth it if you carefully store all the pieces, so that next time you want to play, the game is ready to go!